Straight line depreciation is the simplest way to calculate the depreciation expense line item as shown on the income statement. Without depreciation, the profitability of your business wouldn’t take into account the wear and tear your business has on your company’s assets, like vehicles and equipment. How do I calculate straight-line depreciation? 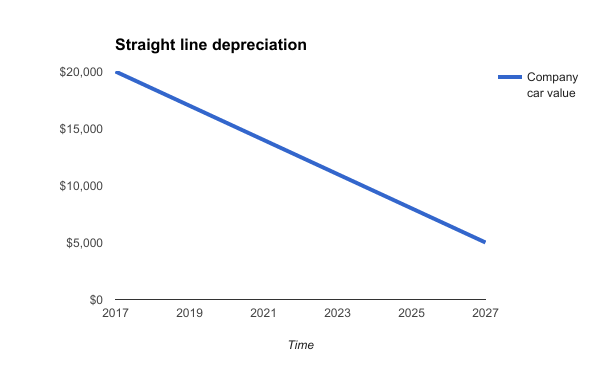 We’ve broken down straight line depreciation for you into 4 easy steps. Take the cost of the asset when it was purchased. This is the book value (how much you paid for the asset) and not what you think you could sell it for in the market. Take the value of the asset at the final term. This is sometimes referred to as the residual value, scrap value, or salvage value. You don’t depreciate the salvage value of the asset because it’s the amount you expect to recover at the end of the assets useful life. Look up what the useful life of the fixed asset. The useful life is the period of time over which you expect to be able to use an asset. The IRS has tables that they have put together for this purpose. You can also look up the depreciation schedule put out by GAAP for book purposes. Use the difference between the cost and the salvage value divided over the useful life of the asset to figure out what the annual amount of depreciation should be. Straight line depreciation means that you depreciate an asset at the same rate throughout the term of the useful life of the asset. So, let’s say you have a car that you use for business purposes only. The current value is based on the purchase price (book value) and is $20,000. The salvage value at the end of the company car’s useful life will be $5,000. Let’s say you bought a gently used Toyota Camry. Those cars don’t really ever drop below $5,000 despite lots of wear and tear, and you decide to plan on ten years of useful life based on the low amount of mileage that you are going to be putting on the car. You know that the difference between the $20,000 book value and the $5,000 salvage value when you’re done using the car is $15,000. It’s over a ten-year period, so every year you’re going down $15,000 divided by ten years so that would be $1,500 a year. In the graph below, I put the value of the company car on the vertical axis. Time is mapped the horizontal axis. You’re going down $15,000 on the vertical axis over a ten-year period on the horizontal axis. I created the graph by taking the point at year zero of the depreciation schedule (2017) and set it the book value of the company car at year zero ($20,000). Then at year one (2018) I depreciated the value of the company car by $1,500 to $18,500. After repeating that process for every year for ten years, I end up with the salvage value of $5,000 in 2027. When you connect all those dots in a line, you’re going to get a straight line, so that’s why it’s called straight line depreciation. Okay so let’s talk about how that actually looks when you’re applying it to your books. If you think about the accounting identity you have assets equals liabilities plus owner’s equity. If your assets are depreciating that means they are going down in value. Since it’s a debit account decreasing in value, depreciation is a credit. We are going to need to an offsetting debit to maintain the accounting identity. The first step would be you would buy a car for $20,000. So you would get a $20,000 asset on your property, plant and equipment line of the balance sheet, and depending on how you pay for it. Let’s just assume actually for this example that you pay for it in cash. You’re going to show an outflow of $20,000 for capital expenditures. So in far as depreciation goes, we’re depreciating $1,500 a year. So that $1,500 would be charged to the income statement for each year for ten years. So that means even though you paid $20,000 in year one and zero dollars in cash after that, you’re going to show profits being reduced by $1,500 in year one, year two all the way to year ten. For our example, each of these $1,500 charges would be balanced against another account, what we call a contra account under your property, plant and equipment on a balance sheet known as accumulated depreciation. The value of your car is going down and so if you’re moving value one place you have to have it balanced in another place. So the offsetting entry is this line then called accumulate depreciation which effectively reduces the value of the assets that you have. When you add an asset in ZipBooks and mark it as depreciable, ZipBooks automatically created a contra asset account to track the accumulated depreciation for that asset. So in year one your balance sheet would show that you have a $20,000 computer, and it would be offset by $1,500 accumulated depreciation contra account. The net value of that asset would be $18,500, and at the end of ten years, the carrying value would be $5,000 and the depreciation expense would basically be done under the straight line depreciation method and you would retire that asset. Retiring an asset means selling it for the $5,000 in cash. If you actually end up selling it for more or less, you would show that as a non-operating revenue gain or expense, respectively. The truth is that straight line depreciation is useful almost exclusively in teaching the concept of depreciation because it is almost never used in the real world. Congress just can’t stay out of accounting that would make it too easy. In most cases you will accelerate depreciation methods on tax returns,so your tax return has one version and your financial accounting reports based on GAAP standards will be different, so you may have a situation where you’re going to have an increase in your company’s intrinsic value because accelerating the depreciation will mean that you saved more cash this year, and that cash can be worked to create more growth or bigger dividends to the owners. The tax accounting reports won’t match the financial accounting records, but they will balance out over time and in the meantime you can create a special adjustment as needed. In a publicly traded company this would be reported in financial filings found in the Annual K and 10K filings. The specifics of these adjustments fall outside the scope of this article but just know that they exist and things can get super complicated, but if you’re getting to that point you might want to use ZipBooks to do your bookkeeping.